Looks like we are in for some SE winds this afternoon and Saturday and along with that comes some rain. Luckily the winds are forecasted to back off mid-day on Sunday and we should be in for a mix of sun and clouds. Fishing has been sporadic this past week. There were definitely some really good days and also some really tough days. There are a few schools of chinook out there, but as usual, they are moving around a lot, hence the sporadic fishing. You usually have time to make one meaningful position change in the day and if you have had the luck of either starting out where the fish are, or finding them when you move, you can have a good day. If you aren’t on them first thing and don’t find them after you move, the writing is usually on the wall. Some of the productive spots this past week are pretty standard for early April and are as follows. QA to the Bell, Roger Curtis to Cowan, and Hole in the Wall. Best depths have been in the 90-120 range. Productive flashers have been in green or chartreuse with glow and the same can be said for spoons, teaser heads, and hootchies. If there is some green or chartreuse on them and some glow, you are in good shape. Here is a picture of one of the better days. Guide Derek had 5 guests on board and they kept 1 fish each. 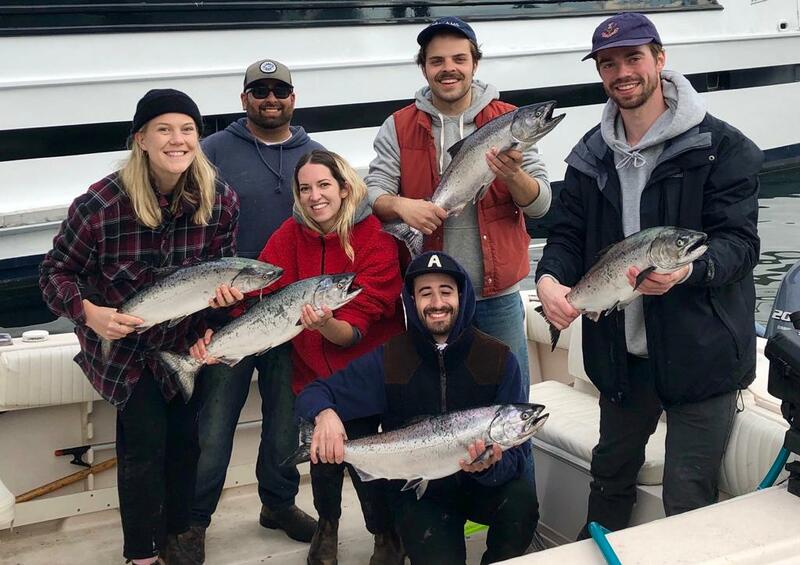 They practiced catch and release on other legal sized fish as they each opted to keep 1 each (the limit is currently 2 per day) to feed their family and friends. So you can see that when you find them the fishing can be good, but it’s a big ocean! Note that DNA analysis will show that these fish are not early or mid timing Fraser River chinook that are the root of a lot management decisions. The data will show they are mixed local Strait of Georgia stocks (perhaps from the Cowichan or Puntledge which had record or near record returns of chinook last year), or US hatchery fish (note 3 of the 5 were hatchery and are very likely from the USA). These strong stocks aren’t the stocks of concern, nor are they the chinook that SRKW (Southern Resident Killer Whales) focus on. I think it is important that all our regular readers and those from other areas understand this. In terms of management decisions regarding chinook, we haven’t heard anything as of Friday morning but the decision could come at any time, perhaps this afternoon. Once it comes out we will post it on our Facebook and Instagram pages.